Andrew Costigan is a Partner in the Litigation Practice Group and a member of the Insurance/Reinsurance Industry Group. His primary area of concentration is reinsurance and insurance coverage disputes involving life, property and casualty, workers compensation, and professional liability lines of business. Andrew’s reinsurance coverage experience includes representation of reinsurers and cedents in resolving disputes over the allocation of continuing losses, number of occurrences, pre-hearing security, follow the fortunes doctrine, and coverage of declaratory judgment expenses. He has conducted depositions or appeared in legal proceedings in England, France, Bermuda, and Switzerland in connection with international arbitrations. Andrew’s insurance coverage experience involves representation of insurers with regard to a wide array of issues arising from CGL, umbrella, marine bumbershoot, workers compensation, and professional liability insurance policies, including allocation of asbestos, talc, and environmental losses over a coverage block, liability to additional insureds, date of loss, related claims, and potential bad faith exposure. Andrew is also familiar with insurer insolvency issues, having represented the liquidators of insurers or reinsurers domiciled in New York, New Hampshire, Kentucky, and New Jersey. He successfully assisted liquidators in prevailing on arguments that the liquidation process alters the normal application of law to an insurance or reinsurance contract in material ways, e.g., that an otherwise appropriate “all sums” recovery is impermissible against an insolvent insurer and a state law voiding a reinsurer’s pre-insolvency arbitration agreement is preserved by the McCarren-Ferguson Act from pre-emption by the Federal Arbitration Act. 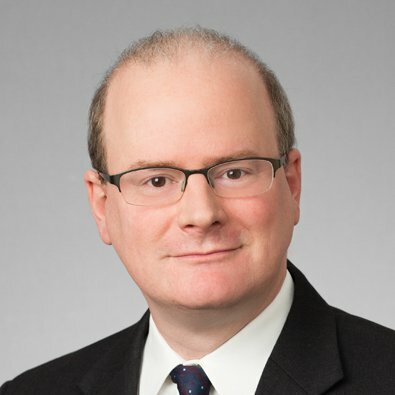 Andrew has handled a broad array of litigation matters, including patent infringement, antitrust, employment, and intellectual property license disputes. He has represented several clients in the negotiation and performance of licensing agreements, scientific advisory board agreements and consulting agreements. He has also advised clients with respect to business acquisitions and negotiated the purchase and sale of businesses. Successfully defended seller of business in an arbitration in which the purchaser sought rescission, alleging fraud and breach of contract. Represented software licensor in federal action against licensee, for breach of contract and copyright infringement. After discerning that defendant had fabricated evidence produced in discovery, successfully moved the court to require defendant to post a bond to secure judgment against it. Ultimately, successfully moved to strike licensee’s answer and obtained judgment against it for further discovery misconduct. Successfully represented purchaser of a business in a federal bench trial on its counterclaim for fraudulent inducement. The action was resolved by a favorable settlement immediately after the client finished presenting its case at trial. Successfully represented software licensor in a federal jury trial against licensee for breach of contract. The jury rendered a verdict in favor of the client.